Carolyn Freeman, MC, FRCPC, is Professor of Oncology and Pediatrics and Mike Rosenbloom Chair of Radiation Oncology at McGill University. A radiation oncologist with more than 30 years of experience, she is known particularly for her expertise in the management of children with cancer. 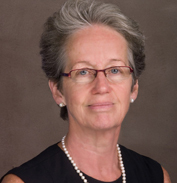 She has played leadership roles in many national and international professional organizations, including as a founding member of the Canadian Association of Radiation Oncologists in 1988 and of the International Pediatric Radiation Oncology Society in 2004, where she is currently President. She has published over 120 peer-reviewed articles and 17 book chapters. Her current roles at the MUHC include Co-Director of the Quality and Performance Improvement Office for the Cancer Care Mission, Clinical Advisor for the new Cancer Centre at the Glen that will open in 2015, and Physician Quality Champion in the MUHC Department of Quality, Patient Safety, and Performance.